GP100 .357 Mag. conversion to 10mm: Factory cyl. is utilized in this conversion, refitted to frame with no endshake, linebored, and rechambered to 10mm. Back of cyl. is cut for full moon clips and chamber mouths chamfered for easier reloading. Factory barrel is rebored to .40 cal. and caliber designation removed. Proper caliber is remarked on frame. Barrel is refitted to receiver, recrowned, and forcing cone cut to 11 degrees. Barrel/ cyl. gap set to .005". Proper height front sight installed. $625 for stainless guns and $675 for blue. 10 moon clips included. Specify brushed or matte finish on SS guns or matte or polished finish on blue guns. 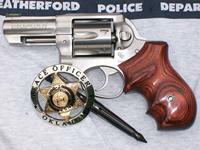 Standard front sight is modified post style, serrated face, .110" wide. Any other sight is extra. These guns tend to be very accurate with .40's and 10's and will handle all commercial ammo. Conversion can be done on fixed or adjustable sight guns. Barrel shortening is not available on fixed sight guns. Picture above shows 10mm conversion with optional fiber optic sight and custom grips. Standard finish on stainless guns is beadblast or satin brushed. Blue guns will be matte or blued with a factory equivalent polish. I have done several in the past. Guns will be able to shoot a 250 gr. bullet @ 1200 fps. A $150 deposit is required on all GP100 conversions.